Research has shown that Neem can control nearly 200 species of insects. It is significant that some of these pests are resistant to pesticides, or are inherently difficult to control with conventional pesticides (floral thrips, diamond back moth & several leaf miners). Neem effectively controls common pests like Thrips, Whitefly, Leaf folder, Bollworms, Aphids, Jassids, Pod borer, Fruit borer, Stem borer, Leafhopper, Caterpillars, Diamond back moth. Thus, Neem is a broad spectrum pesticide and even compatible with most chemical pesticides. Neem works as insecticide by intervening at several stages of the life of an insect. It may not kill the pests instantaneously but incapacitate it in several other ways. 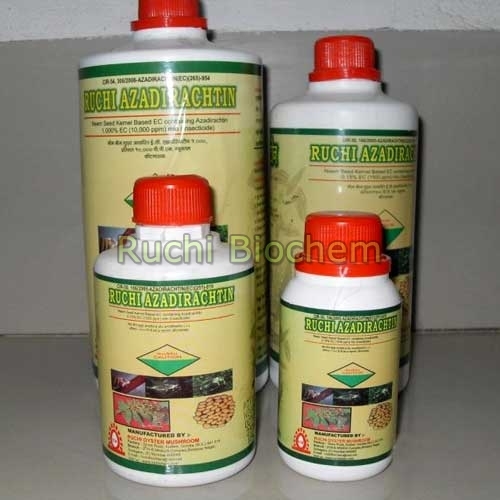 Azadirechtin botanical insecticide acts in various ways like as antifeedant, as repellent, as growth inhibitor and also has ovi-position deterrent effect.